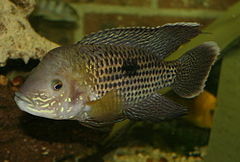 The Green Terror (Aequidens rivulatus) is a colorful freshwater fish in the cichlid family. The fish originates from the Pacific side of South America in the coastal waters from the Tumbes River in Peru to the Esmeraldas River in Ecuador. Males and females may reach lengths of 30 centimetres (12 in). As the name implies, late-juvenile-phase and adult-phase specimens can be very aggressive. This is not guaranteed, however, and peaceful individuals can be observed. Juvenile green terrors are often sold in pet and aquarium stores for the aquarium hobby. This species is not to be confused with the blue acara cichlid, Andinoacara pulcher), which is similar in appearance; the Blue Acara is not as aggressive and does not grow as large as the Green Terror. In nature, Green terrors live in a tropical climate and prefer water with a 6.5–8.0 pH, a water hardness of 25.0 dGH, and a temperature range of 20–24 °C (68–75 °F). Care Level: Easy if kept alone. Care level can vary based on your specific tank conditions. Care: Please feel free to contact us for compatibility help.